Book online or call our cruise experts at 877-510-2929 for details and pricing! ‡FREE Stateroom Location Upgrade applies to booking the stateroom location you wish to sail in for the price of the lowest category within that stateroom type (Interior to Interior, Oceanview to Oceanview, Balcony to Balcony). Upgrade offer excludes select categories, including, but not limited to, premium categories and suites. 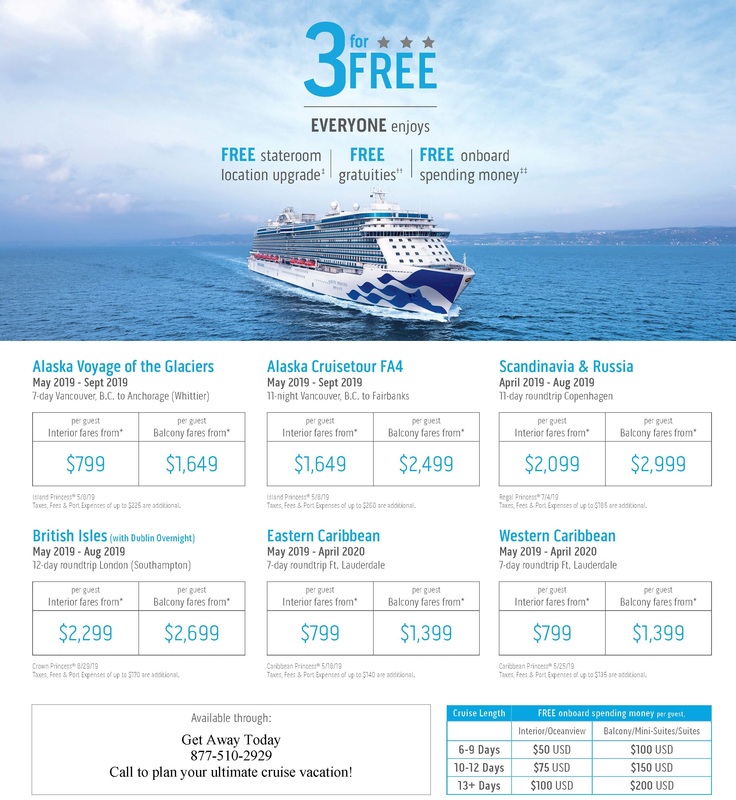 Offer does not apply to the land portion of a cruisetour. ††FREE Gratuities do not include gratuities added to bar charges, dining room wine accounts or Lotus Spa services. Gratuities are not transferable, non-refundable, and have no cash value. ‡‡FREE Onboard Spending Money offer is applicable to all guests (up to 4) in a stateroom. Guests with single occupancy will receive double the per guest credit amount. Spending money may be used on a single voyage only, is not redeemable for cash, and cannot be used in the casino and expires at the end of that voyage. *Fares apply to minimum lead-in categories on a space-available basis at time of booking. Fares for other categories and dates may vary. Fares are per guest, non-air, cruise- or cruisetour-only, based on double occupancy and apply to the first two guests in a stateroom. These fares do not apply to singles or third/fourth-berth guests. This offer has limited space regardless of cabin availability and may not be combinable with any other public, group or past guest offers, including Air discounts and onboard credits. Offer is available to residents of the 50 United States, Canada, Puerto Rico, Mexico, Bermuda and the District of Columbia who are 21 years of age or older and receive this offer. Fares quoted in U.S. dollars. Please refer to princess.com for terms, conditions and definitions that apply to all bookings. Deposit of 10% of cruise fare per guest for bookings made under 3 for FREE is refundable. Note: For assistance reserving a wheelchair-accessible stateroom, please call 1-800-774-6237. Offer expires: 11/19/18 Reference promotion code: N9-.